Making wine is a long, slow process. It can take a full three years to get from the initial planting of a brand-new grapevine through the first harvest, and the first vintage might not be bottled for another two years after that. But when terroir and winemaking skill combine, the finished product is worth the wait. Wine has been likened to “poetry in a bottle.” Just like any creative process, winemaking requires knowledge, commitment, and time. In this article, we’ll take a look at the grape-growing process, as well as explore more of the winemaking process once the grapes have been harvested. 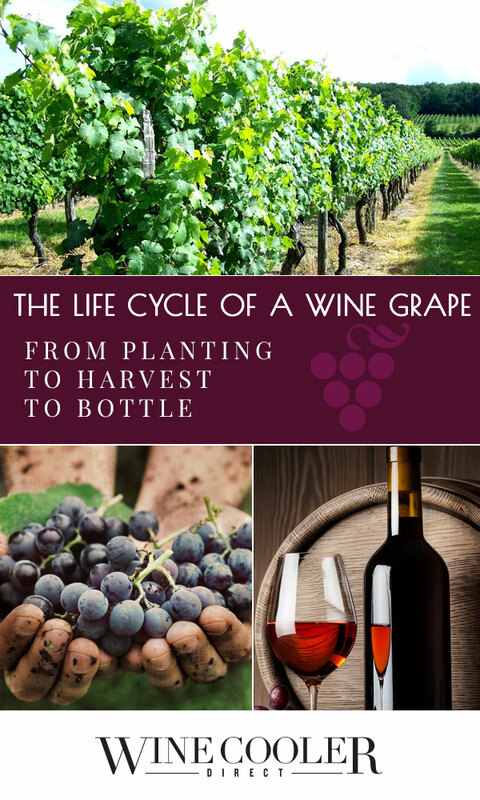 From the first planting to harvesting to turning it into wine, this is the complete life cycle of a wine grape. Imagine you’re starting with raw land. First, you have to assess the soil and the climate to determine which grapes will flourish. In the Napa Valley, Cabernet Sauvignon is king. But that doesn’t mean it’s right for every location. Rocky soil and warm temperatures are excellent for growing Cab. Cooler microclimates and sandier soil provide great growing conditions for Sauvignon Blanc. A vineyard manager may also recommended planting smaller amounts of other grapes for blending, such as Malbec and Petit Verdot. Some vineyards strive to grow all five of the “noble” Bordeaux grapes: Cabernet Sauvignon, Petit Verdot, Malbec, Merlot, and Cabernet Franc. Others focus on just one varietal, like Cab. Fun fact: Although Malbec has become synonymous with excellent wine from Argentina, its roots are French! In addition to assessing microclimates and choosing the right grapes for each site in a new vineyard, the vineyard manager decides how to orient the rows, how to space and trellis the vines, and how to amend the soil, if necessary. 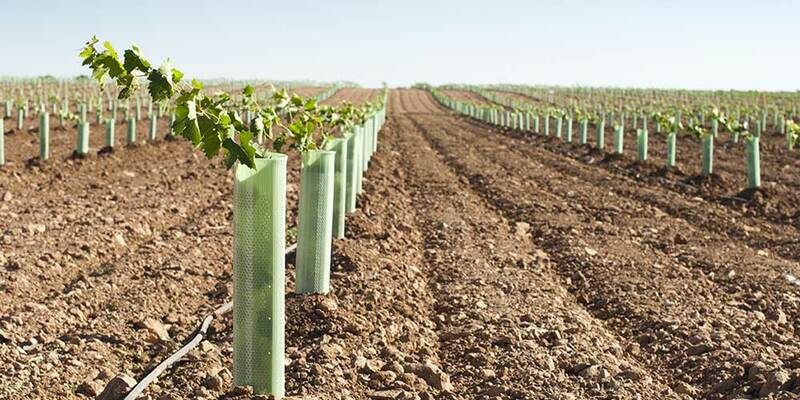 Cartons are placed around newly planted vines to provide protection and warmth. Then comes the hard part — waiting for that first harvest. 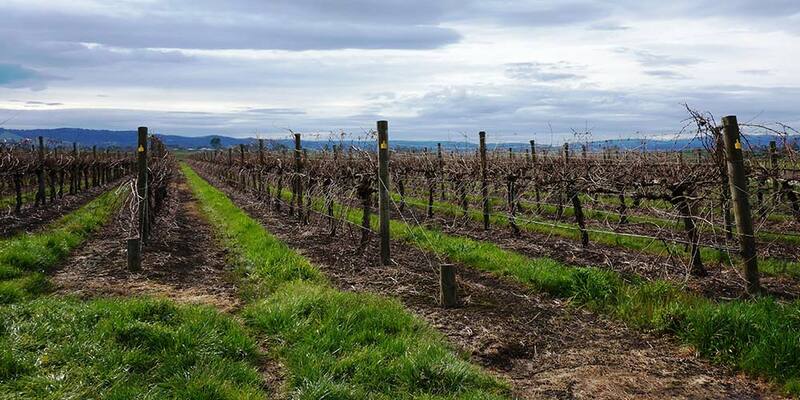 Over the next several years, the young vines will need lots of care and attention, including judicious watering, proper pruning, and protection from pests and disease. Dormant vines in winter have a certain stark beauty. But the roots have burrowed deep into the soil and are feeding on the nutrients needed to produce fruit. When the vines are dormant, it’s time to prune. 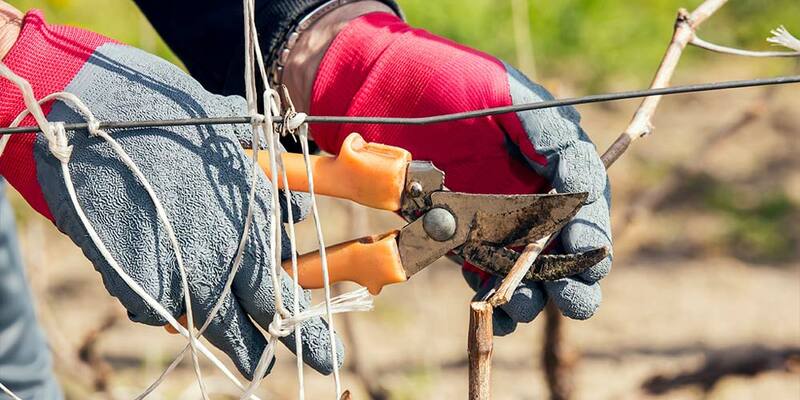 Proper pruning is essential to promote the right balance between the number of shoots and the number of buds, which will produce grape clusters. Too many shoots and not enough buds means that the vines will have too many leaves shading the fruit, making it hard for the clusters to ripen. Too many buds and too few shoots produce a similar problem — there’s so much fruit that none of it will ripen well. Poorly pruned vines simply won’t produce high-quality fruit. And without high-quality fruit, winemakers can’t make high-quality wine. Pruning is a valuable skill that can greatly affect the harvest to come. Pruning skills are so prized that the Napa Valley Grapegrowers holds a pruning contest each year in February. In 2016, the winning pruners took home $4,500 in cash and prizes. When wines emerge from dormancy, the first buds appear. This period is called bud break, and it generally starts in March. That’s also when colorful mustard, a cover crop, blankets the ground between vine rows. 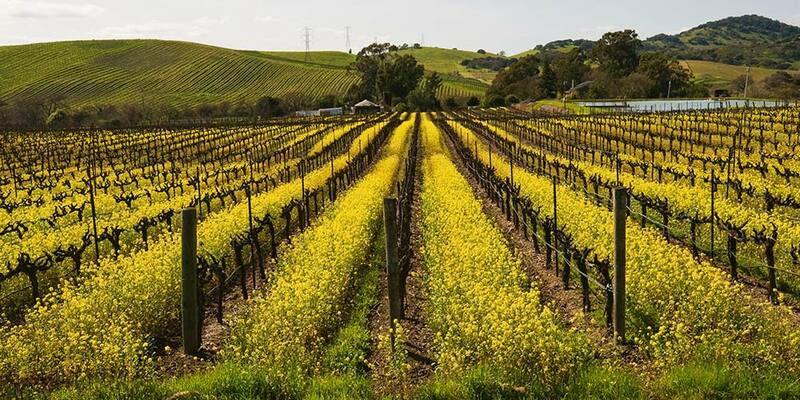 Mustard adds a pop of color to vineyards in late winter and early spring. It’s also a cover crop that prevents soil erosion on hillsides and can suppress soil-borne pests. Early spring is a wonderful time to visit Napa. The scenery is beautiful, the summer crowds haven’t yet arrived, and the days are usually mild and dry. The nights, however, can be a different story. Vineyard managers keep a careful eye on nighttime temperatures because if the thermometer dips below freezing, all those tender shoots can sustain serious damage — especially once the buds swell into flowers. The flowering stage happens about a month after bud break. Some vineyards use giant wind machines to circulate the air and keep cold air from damaging the vines. 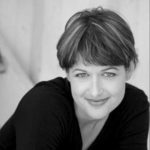 While living among the vineyards is certainly picturesque, being jolted from a deep sleep at 3:00 AM by a giant fan that makes as much noise as a low-flying plane is a drawback. But what’s a little lost shut-eye if it means protecting the harvest? Other vineyards protect new growth by using huge sprinklers to coat the vines with water. It may seem counter-intuitive, but when the water freezes on the vines, it actually protects them because the freezing process produces a little bit of heat. It’s science. Because there are so many different microclimates within the Napa Valley, flowering can take place over a two-month period. Sometimes, those fans and sprinklers go off on a nightly basis, especially in cooler regions like Carneros and on mountaintop vineyards like Howell Mountain and Atlas Peak. Most grapevines self-pollinate, after which fruit set occurs. This is when you’ll see small, green clusters of grapes on the vines. Fruit set usually begins in May, and if the weather doesn’t cooperate, vineyard managers still have to worry about frost. Not all the vines will pollinate, so fruit set is an important indicator of crop yield. If many of the vines aren’t showing fruit clusters, yields will be low. In Napa, where Cabernet grapes can command an average of $6,300 a ton, low yields can be an economic disaster for vineyard owners. Around this time, vineyard crews will work on canopy management, or leafing, to control the amount of sunlight and air that the fruit clusters receive. Grapes need sunlight to ripen, but too much sun can give the fruit a sunburn. According to Napa Valley Vintners, vineyard workers may tend to each row of vines 20 times in a single growing season. In addition to canopy management, the vineyard workers will inspect the fruit clusters and cut away any clusters that aren’t developing properly. It can be tough for growers to see so much fruit dropped, but this crop thinning helps the vines send their energy only to the best clusters and results in high-quality fruit. The Napa Valley Vintners point out that while Napa vineyards produce only about half the fruit per acre compared with other grape-growing regions, the price per ton for Napa grapes is about five times higher than for other California grapes. So, the quality control pays off in the long run. Veraison is the magical moment when those hard, green grapes transform into plump, juicy clusters. 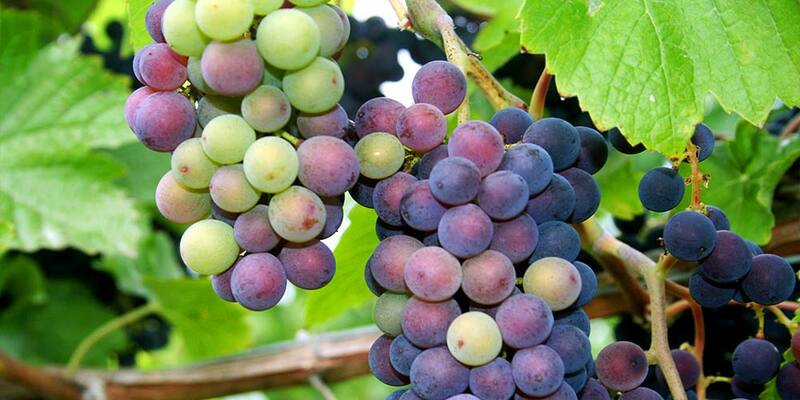 Veraison is especially noticeable in red grapes as the fruit turns from green to purple. In white grapes, like Sauvignon Blanc and Chardonnay, the clusters turn from bright green to a more mellow golden green. Veraison occurs in the warm summer months as the grape clusters ripen and develop sugars. The grapes soften and change color. Veraison is an indication that the grapes are ripening and developing sugars. In Napa, this usually happens in late July or August. Vineyard workers will watch the grape clusters carefully. They may prune the canopy of grape leaves again to allow for more ripening, or they may drop more fruit if they see too many clusters or uneven ripening. Napa has a Mediterranean climate, with warm to hot sunny days and cooler nights. The heat of the day promotes sugar development and allows the grapes to ripen, while the lower nighttime temperatures keep the grapes’ acids from dissipating completely. The balance between sugar and acid is what makes Napa grapes so sought after for winemaking. At last, the time has come to harvest those beautiful grapes! But how do growers know when to pick? It’s certainly not an exact science, although winemakers and vineyard managers will measure the sugar levels in the grapes (called Brix). A series of warm days can speed up harvest because ripening happens fast in hot weather. Cooler temperatures, on the other hand, can delay harvest. But ultimately, it’s the flavor profile of the grape that determines pick date. White grapes are harvested earlier than red grapes. But grapes meant to be used in sparkling wine are harvested earliest of all because a lower sugar content in those grapes is desirable. 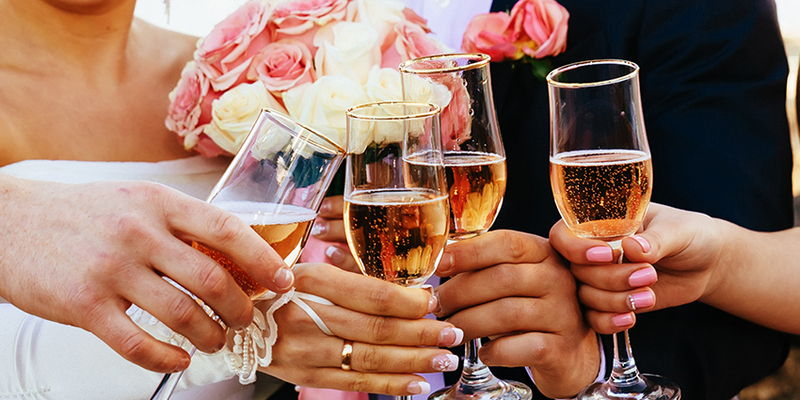 In fact, Mumm Napa is almost always the first to harvest. In 2015, Mumm kicked off the harvest on July 22, the earliest start on record. Whites like Chardonnay and Sauvignon Blanc are harvested next, often in August and September. These grapes just don’t need as much time on the vine to ripen. Pinot Noir, Merlot, and Malbec come in next. Finally, Cabernet Sauvignon and other robust reds like Petite Sirah are harvested. Ripe grapes are collected in bins and trucked to the winery for crush. Harvesting usually starts in the wee hours of the morning—perhaps around 3:00 AM, when the air is cool. That’s because winemakers don’t want the grapes to start fermenting before they reach the crush pad, and the heat of the day will absolutely start the fermentation process. It’s been three long years from planting to first harvest, and we still don’t have an ounce of wine! But don’t worry—once all the grapes are harvested, the winemaking process begins in earnest. Here’s what happens after the grapes are plucked from the vine and placed in the harvest bins. 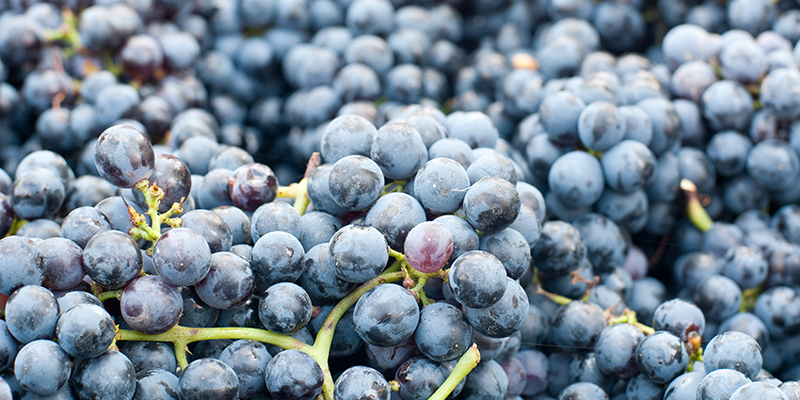 Grape juice starts out clear, whether it comes from red wine grapes or white wine grapes. 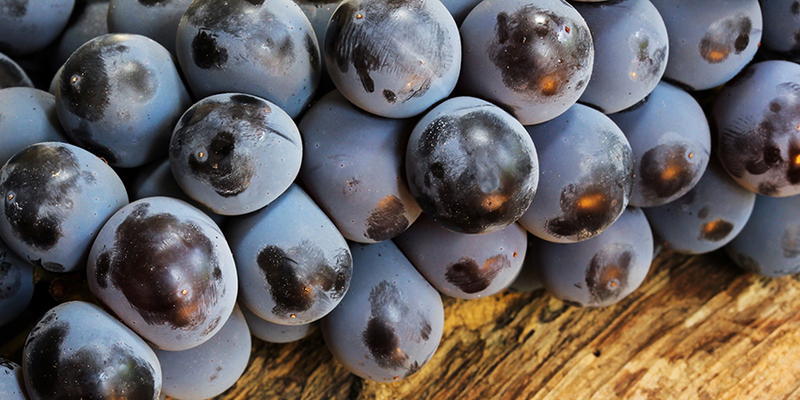 In order for red wine to pick up that beautiful color, the grape skins must remain in contact with the juice. First, the grapes get sent through a destemmer because the stems contain tannins, and the wine will pick up plenty of tannins from contact with the stems. Then, the grape clusters are crushed to break open the berries. The old-fashioned way to crush grapes. 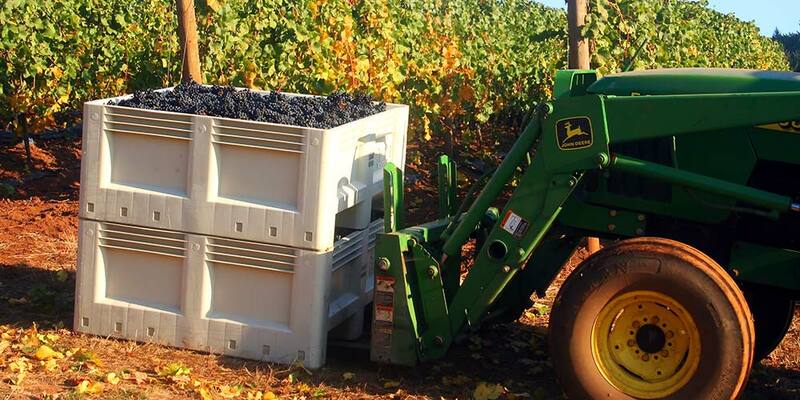 These days, most wineries use a machine. After crushing and destemming, the red grapes are put into a tank for primary fermentation. White wine grapes, which are harvested earlier than red wine grapes, often go right from the field to the press. Sometimes, the grapes are crushed, but certain winemakers choose to skip that step. Instead, they press whole clusters of grapes, skins, stems, seeds, and all, and the juice goes directly into the barrel or the tank to begin the fermentation process. White grapes are usually pressed quickly to ensure minimal contact between the juice and the skins, stems, and seeds. That way, the resulting white wine won’t pick up unwanted color or tannins. Once the grapes are pressed, the skins, seeds, and stems clump together into “pomace,” which can be returned to the vineyard soil as a fertilizer. Red grapes won’t be pressed until after primary fermentation. At this point, the red grapes have been destemmed and crushed, while the white grapes have been pressed. Now, primary fermentation begins, and it can last up to a month. Once yeast converts the sugars from the grapes into alcohol, the red wine grapes are pressed and the juice is pumped into barrels (or some other vessel) for aging. Since the white wine grapes have already been pressed, what happens next depends on the varietal. Chardonnay requires malolactic fermentation to develop creamy, buttery flavors, so it will go into barrels for further fermentation. In Sauvignon Blanc, on the other hand, a certain crisp acidity is desirable, so winemakers will work to prevent malolactic fermentation in these grapes. Once primary fermentation is complete, a month or more has gone by since harvest. 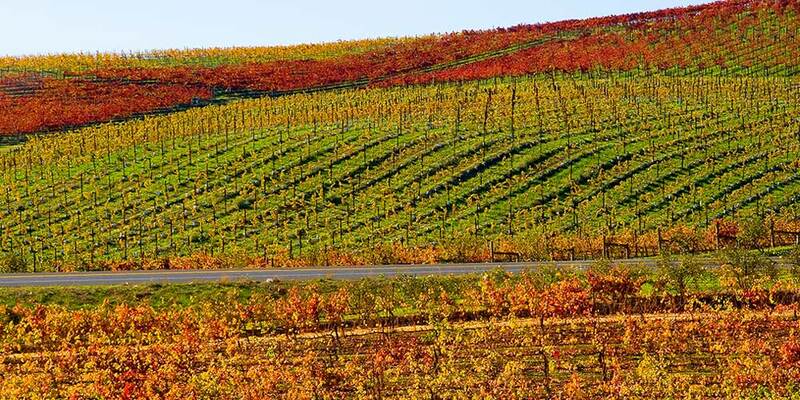 The vines are preparing for winter, and Napa vineyards are showing off some fall color. The air is cooler and the vibe is mellower. But the winemakers are still hard at work. The Napa Valley version of fall color. After primary fermentation, the wine will be transferred from the fermentation tank to another vessel for aging. Sauvignon Blanc often goes into stainless steel tanks or a concrete egg, while Chardonnay and red wines will go into oak barrels. New French oak? American oak? Hungarian oak? Light toast? Dark toast? Reused barrels? The question of which oak barrel to use is a subject that many winemakers are passionate about. There’s no one right answer. 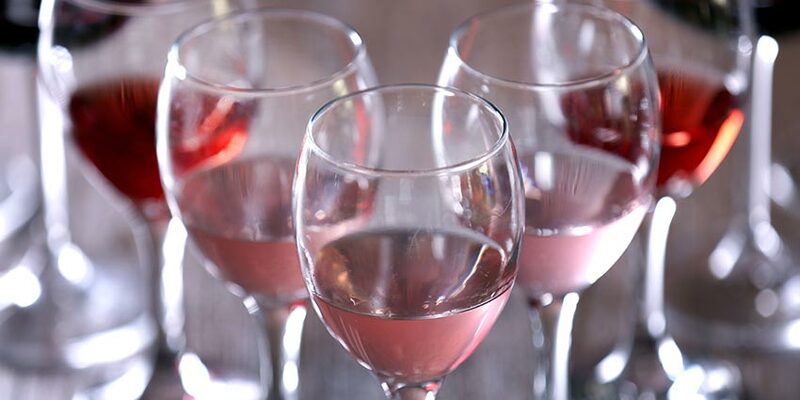 It all depends on the flavor profile that the winemaker hopes to achieve. Malolactic fermentation (ML) takes place during the aging process. All red wine goes through ML, and certain whites, like Chardonnay, also go through ML. This process is what gives Chardonnay its creamy mouthfeel and some of that signature buttery flavor. Malic acid, which is commonly described as having a “green apple” flavor, gets converted to lactic aid, which is creamy, smooth, and buttery. In red wine, you won’t necessarily taste a buttery flavor, but you may sense a nutty aroma, and the wine may feel satiny in your mouth. ML is what helps provide a smooth, rich mouthfeel. What about Sauvignon Blanc and whites like Gewurztraminer, where ML isn’t wanted? The winemaker will prevent the process by filtering the wine to remove the bacteria that cause it. 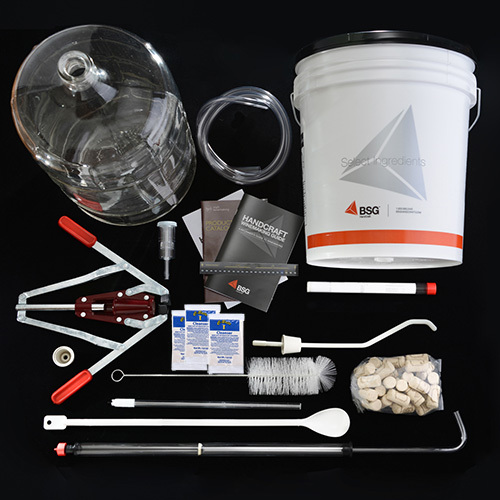 Once ML is complete, winemakers will usually add a very small amount of sulfur to the wine as a preservative to stabilize the wine. “Without sulfur, you end up with an unstable wine that would not age gracefully,” says vineyard consultant and winemaker Dave Bos of Bos Wines. 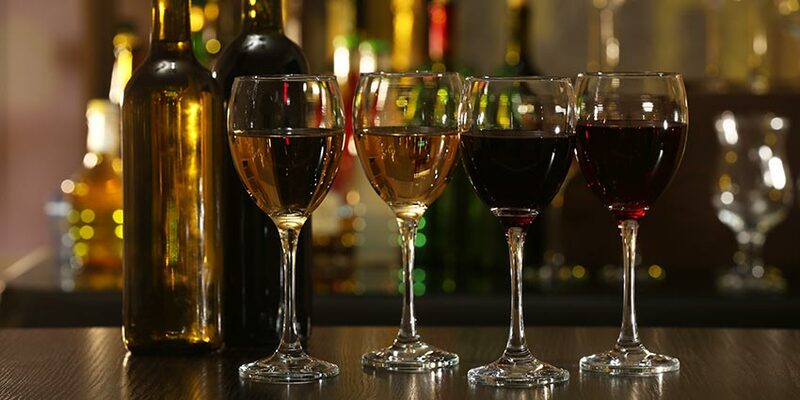 “In other words, the wine would be kind of a hot mess.” Some consumers shy away from sulfites, but Bos notes that there’s more sulfur in one handful of dried fruit than there is in four bottles of wine. 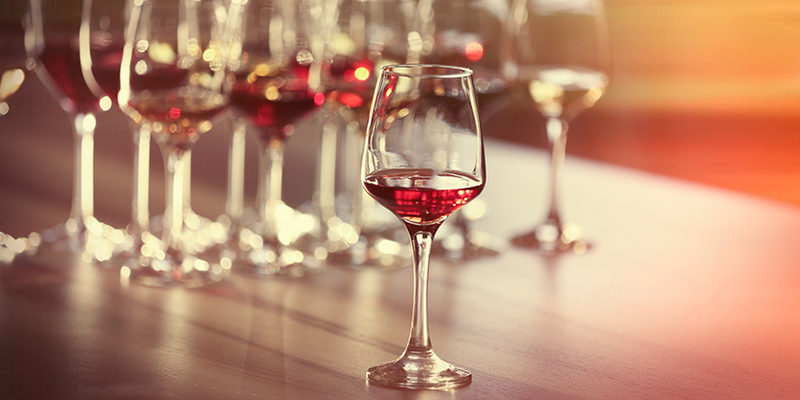 In addition to adding sulfur, winemakers may also use “fining” to remove proteins and excess tannins that may cause haziness or unwanted flavors in the wine. Winemaking isn’t an exact science. There’s no perfect recipe to create a bottle of wine that’s guaranteed to garner a high score from the wine critics. So while the wine is aging, the winemaker will continually taste and evaluate the wine. Slowly, a flavor profile will emerge. According to Bos, Sauvignon Blanc begins to show its flavor profile after about three months. “Making red wine is more like slow cooking,” he says. “You can throw a pork shoulder in a slow cooker, and it might technically be done in two hours, but you wouldn’t want to eat it. It needs more time for the flavors to develop.” And it’s the same story with Cabernet Sauvignon. At six months, the wine tastes unfinished. It might not show a real flavor profile until it’s been in the barrel for a year or more. It’s up to the winemaker to decide how long to age any particular wine, but in general, Sauvignon Blanc will age for four to six months, Chardonnay will age for 10 to 16 months—depending on the style the winemaker is going for—Pinot Noir might spend 12 months in the barrel, and Cabernet Sauvignon will age for 18 months to two years, or even more. Toward the end of the aging process, winemakers will taste the wine frequently to ensure the flavors are just right. They do this with a “wine thief,” a special tool that extracts a small amount of wine from the container it’s aging in. 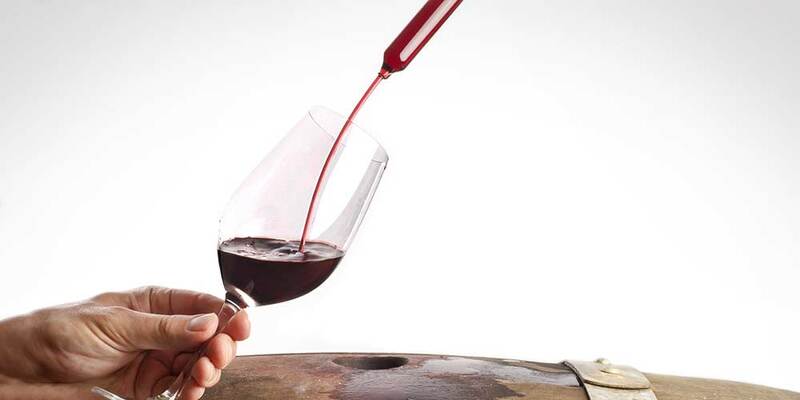 Winemakers use a tool called a wine thief to taste unfinished wine as it ages in the barrel. Before bottling, the wine is racked, filtered, or both to remove sediment and clarify the wine. At last, it’s time to fire up the bottling line! Small producers, like Bos, can set up a small bottling line and complete bottling in an hour or so. But then, he’s only bottling 55 cases. Larger producers, like Grgich Hills, where Bos used to work as a vineyard manager, may be bottling 30,000 cases of Chardonnay alone. They use much more powerful bottling lines and can bottle as many as 200 cases in an hour. Even with the fastest technology, the more wine you have to bottle, the longer the process will take. Yes, wine will continue to change in the bottle. That’s why proper wine storage is so important. To ensure that a special bottle you purchased will still be drinkable 10 or even 20 years from now, you need to store it in a climate-controlled environment with just the right level of humidity. After all, that wine you purchased may have been five years or more in the making. Show it some respect with proper storage in a wine refrigerator, so that you can enjoy your wine now — and for years to come. Wow, thank you so much for explaining the whole process from planting to bottling. Very informative. The only suggestion I may make, you touch briefly on the storage process;could you elaborate a bit on that please. This is very informative and it came to me at the right time when I am, plannimg to plant grape.